Motorhead performed their final show in Spain at Resurrection Fest last summer, and organizers have released pro-shot video of the band’s full performance. 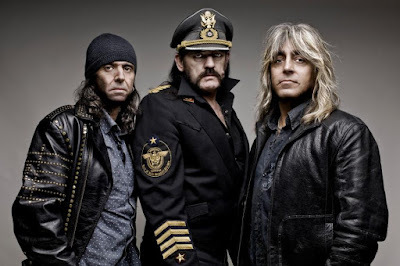 The July 17, 2015 appearance at the festival in Viveiro saw Lemmy Kilmister, Phil Campbell and Mikkey Dee play what turned out to be their final concert in the country as Lemmy passed away at his Los Angeles home on December 28 at the age of 70. While video of the 13-song set is professional quality, organizers describe the sound as "ambiance audio." The set captures the band over two shows at the Zenith in Munich, Germany last November on what turned out to be their final tour. “Clean Your Clock” will be available in multiple formats, including Blu-ray/CD and DVD/CD combos, CD, colored vinyl, digital download and two box set options: one with the DVD/CD and colored vinyl which includes a Motorhead Metal Medal, and a limited-edition package offering the Motorhead Medal in Silver or Gold. Surviving members Campbell and Dee will join Saxon on stage to play a special one-off set of Saxon and Motorhead classics in a unique Salute To Lemmy at this year's Metal Hammer Golden Gods Awards show at the Eventim Apollo in Hammersmith on June 13. "Just 'Cos You Got The Power"